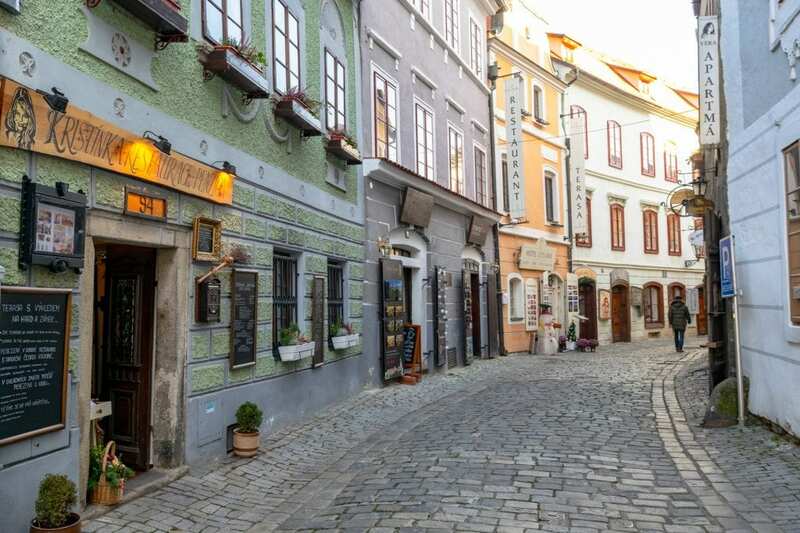 If you’re putting together a travel itinerary through Central Europe, you can’t go wrong adding a short trip from Vienna to Český Krumlov. This fairytale village in South Bohemia is an absolute treat to visit, and its small size means that a day or two is all that it needs! 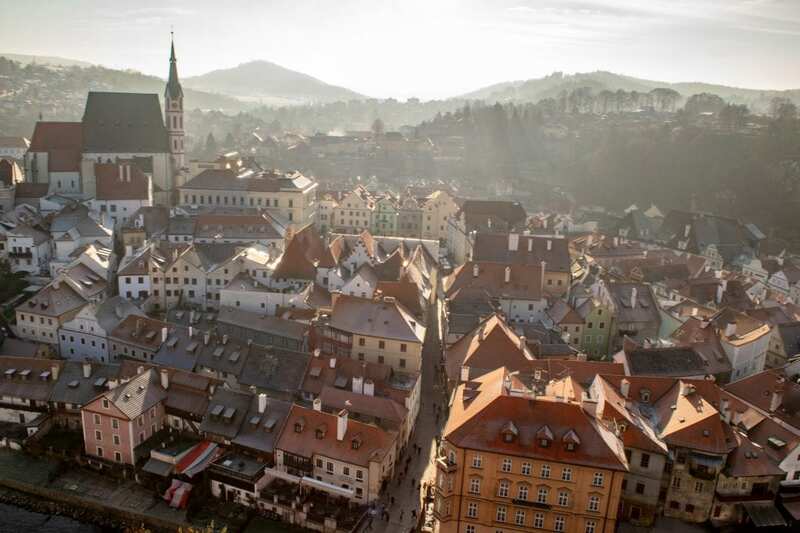 Whether you plan to continue north after visiting Český Krumlov (perhaps to Prague or Brno? ), dip back into Austria, or something else entirely, a trip from Vienna to Český Krumlov is absolutely worth the time. After spending a few days in Vienna, we found traveling from Vienna to Český Krumlov by train is a fairly straightforward and an entirely lovely trip–the views of the Austrian and Czech countryside are marvelous, the trains comfortable, and the journey enjoyable. By traveling by train, we genuinely felt that we were able to add to rather than detract from our experience (and our general dislike of unnecessary bus travel helped that opinion along, as well). It does require a few steps, but they’re easy to navigate. If you’d like to keep things as simple as possible, consider using a Eurail pass: we partnered with Eurail to hop around Central Europe, including traveling from Vienna to Český Krumlov, and our experience was made incredibly simple by having our passes in hand! Because of the passes, we didn’t need to worry about purchasing any tickets in advance or buying them throughout our journey–we simply wrote our route down on our passes and hopped onboard. 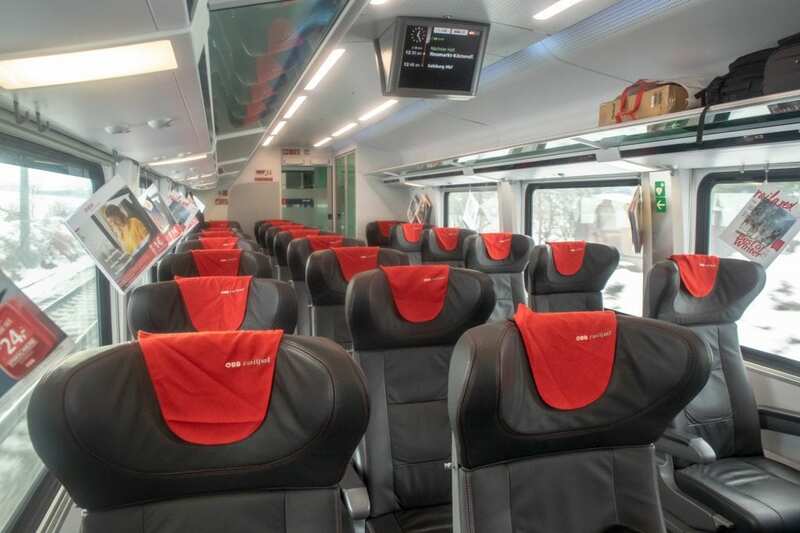 Regardless of whether you are using a Eurail pass or traveling independently, though, the steps are the same–here’s the best way to travel from Vienna to Český Krumlov by train! 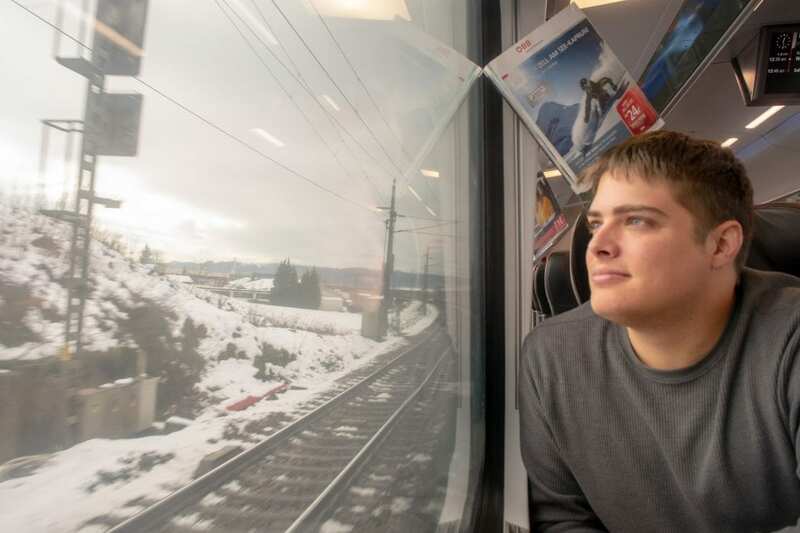 Interested in European train travel? Book your Eurail pass to travel throughout Europe today! The trains from Vienna to Linz are near-constant, so when you decide when you want to travel from Vienna to Český Krumlov, check the schedule and start making a plan! Vienna’s main train stations tend to run on the larger side, so before heading out the door, be sure to double-check which station you intend to leave from (most likely it will be Vienna HBF) and give yourself plenty of time to get there! After arriving in Linz, it’s time to get ready to cross from Austria into Czechia! Trains run from Linz to České Budějovice roughly every 2 hours. The Linz HBF train station is fairly easy to navigate, and there are a few restaurants and shops in the station if you’d like to grab a quick bite to eat while there (you’ll want to avoid being hungry at the small České Budějovice station). The trains from České Budějovice to Český Krumlov are timed with the arrivals of the trains from Linz, so while you should double-check the schedule, you should be able to count on a short wait time in České Budějovice. Unlike the other two trains on this route, the trains that run between České Budějovice and Český Krumlov are quite small, so be prepared for possible crowds. On this train, we experienced standing room only when heading to Český Krumlov and a completely empty train when we returned via the same path. The best way to reach the center of Český Krumlov from the train station is to take a taxi. Taxis tend to congregate in the parking lot in front of the station when trains arrive, but just in case there aren’t any nearby, there are large advertisements with phone numbers for several companies on the side of the building across the street from the train station. You’ll definitely want to make sure that you have a phone that works in Czechia for this leg of the journey! We used Green Taxi a couple of times while in Český Krumlov and had friendly and fair drivers both times. The rate for a taxi is roughly 100 Czech koruna, or a steeper rate of 4-5 Euro if your driver is willing to accept it. Alternatively, you can walk about 25 minutes downhill into the town center, or take the bus from the nearby Špičák stop which will cut a solid portion of the walk. Start by deciding when you plan to take the train from Linz to České Budějovice and work backward from there. Trains from Vienna to Linz are almost constant, and trains from České Budějovice to Český Krumlov are generally timed to work well with the times that trains arrive at České Budějovice, so it’s the middle journey you should decide on first when making your plans. Since Austria and Czechia are both within the Schengen Zone, there is no formal border crossing to travel between them. 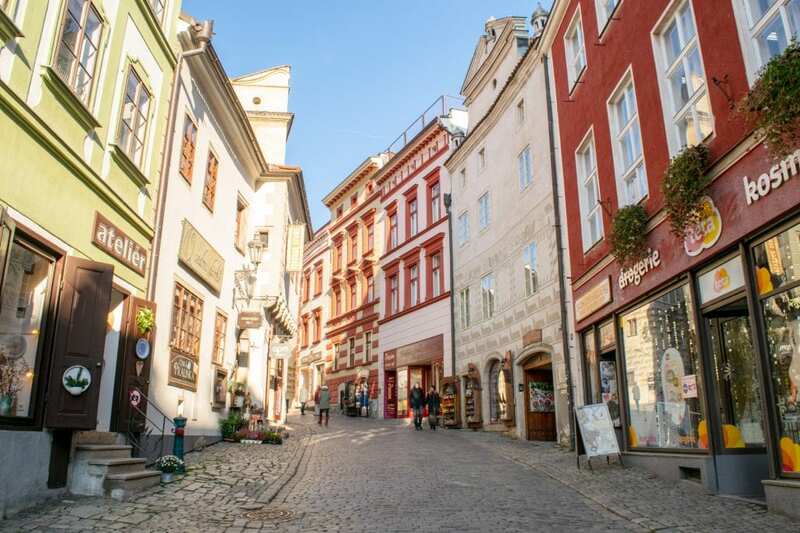 However, random identity checks may occur at any point, so be sure to have your passport and any applicable visas handy when you travel from Vienna to Český Krumlov! Don’t plan to eat lunch at the České Budějovice station. The station is very small, with just a few stands selling snacks, coffee, pastries, etc. 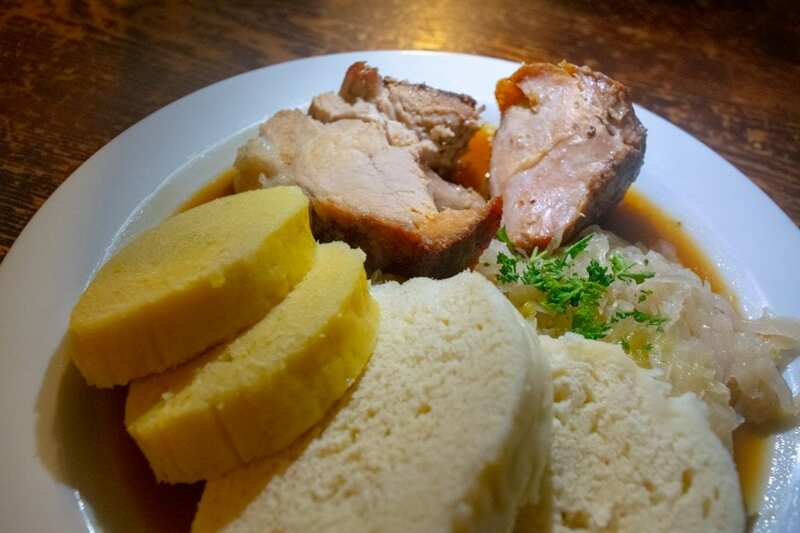 Better to pack something from Vienna, or just plan to eat a hearty Czech meal once you arrive in Český Krumlov! Plan about 4.5 hours to reach Český Krumlov from Vienna. On average, you can expect the 3 train rides, including transitions between them, to take about 4.5 hours. Remember, you’ll need to change currencies. Though Czechia is part of the EU and Schengen Zone, it does not use the Euro as its currency. While Euros are widely accepted in Český Krumlov, the exchange rate tends to be rather terrible. You’ll spend less if you pick up some Czech koruna during your visit. We found that credit cards were accepted sporadically in Český Krumlov, but it wasn’t at all uncommon to come across restaurants that only took cash–so if you plan to stick to only paying with cards during your trip, be sure to inquire whether they’re accepted before sitting down for a meal. These are all regional train routes, so they don’t require reservations. 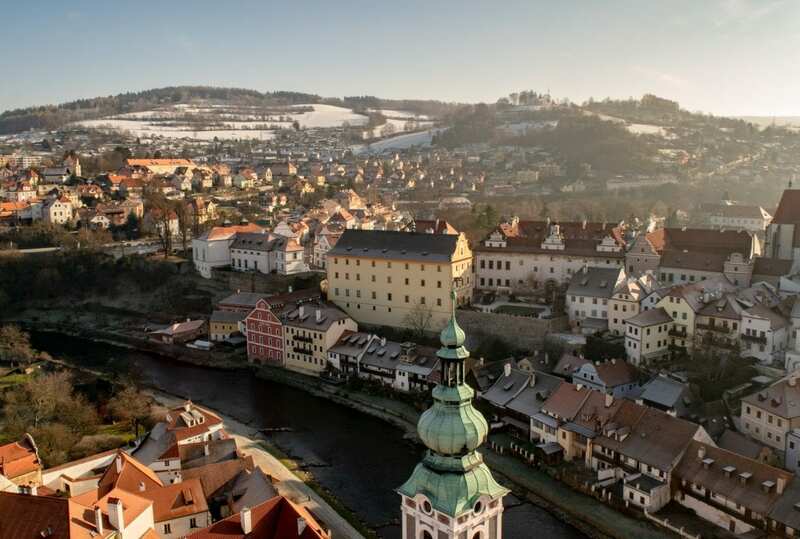 If you decide to take a last minute trip from Vienna to Český Krumlov, don’t worry: none of these trains require reservations or advance planning! You can purchase tickets for the first two routes at the Vienna train station you intend to leave from right before departing, and you can purchase tickets for the České Budějovice to Český Krumlov route either at the České Budějovice station or on the train itself. Want to make traveling by train even easier? Book your Eurail pass today! Penzion TOP — We loved this little place! With clean and cozy rooms, a beautiful view of Český Krumlov, an extremely quick and easy walk into the city center, and an incredibly friendly owner, we couldn’t ask for anything more–especially at their incredibly affordable prices. Check rates & book your stay at Penzion Top! Many thanks to Eurail for providing us with our Eurail passes for this journey! All opinions are, as always, our own. We will have an overnight layover in Vienna on our way to Morocco and on the way back. The first time will be pretty long as we will land around 2PM and leaving at 9AM the next day. On the way back we are landing at 7PM and leaving at 10AM the next day so we won’t have as much time. Any suggestions? We are staying near Wien Mitte station, and plan to walk around the downtown core, but we also want to visit the Schönbrunn Palace, which does not seem like it is walking distance. If you’re going before Christmas, definitely the markets! The biggest one is at Rathausplatz, and Schonbrunn is lovely as well (you can basically throw a stone and hit a market in Vienna right now). If you’re going after Christmas, Schonbrunn Palace is the perfect way to spend an afternoon–it probably won’t be walking distance, Vienna is pretty spread out, but it’s easy enough to get there on the tram. I’d also recommend stopping by one of Vienna’s famous cafes–they’re beautiful and quite the experience! Cafe Central is well-known and within the historical center, as is Demel, which is well-known for its desserts. St. Stephen’s Basilica is also within walking distance from there and is worth ducking inside. It’s free to enter, and you can climb to the top for a small fee. Thanks for all the suggestions. Unfortunately both times we will be there mostly for the evenings. We are going before Christmas and after. So when we are at the airport, do we buy the 24 hour pass and a zone 1 ticket? I’d run the numbers to see if the pass is worth it, but otherwise yes! A single ride is 2.4 Euros.